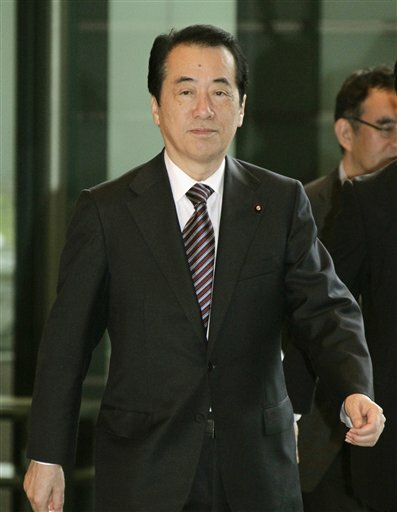 Tokyo - Japan’s Prime Minister Naoto Kan says he will consider resigning once Japan’s efforts to recover from its earthquake and tsunami disaster take firm hold. Kan told members of his party Thursday that he felt responsible for carrying through with leading the recovery. He made the comments ahead of a no-confidence vote in parliament. Kan, who became prime minister just a year ago, has been criticized for delays in construction of temporary housing for evacuees, lack of transparency about evacuation information, and a perceived lack of leadership. On Wednesday, the largest opposition group, the Liberal Democratic Party, submitted the no-confidence motion along with two smaller opposition groups. A turn for a turn. Japan's Prime Minister & Foreign Minister should resign ASAP for putting their country in direct harm by assisting Iran in their nuclear program. Several weeks before the Fukushima accident, Japanese deputy minister for foreign affairs Bessho Koro visited Tehran to met with Iranian Foreign minister Ali Akbar Salehi and carry the message of a pro-Iran Japan. Some 70% of Iran’s low enriched uranium stockpile would be moved to Japan. Japan would then take responsibility for the stockpile, and ensure the delivery to Iran of fuel rods for nuclear "medical use". In November, a Japanese diplomat, Yukio Amano, succeeded Mohamed ElBaradei to become director general of the IAEA, in effect the top international nuclear negotiator in the world.